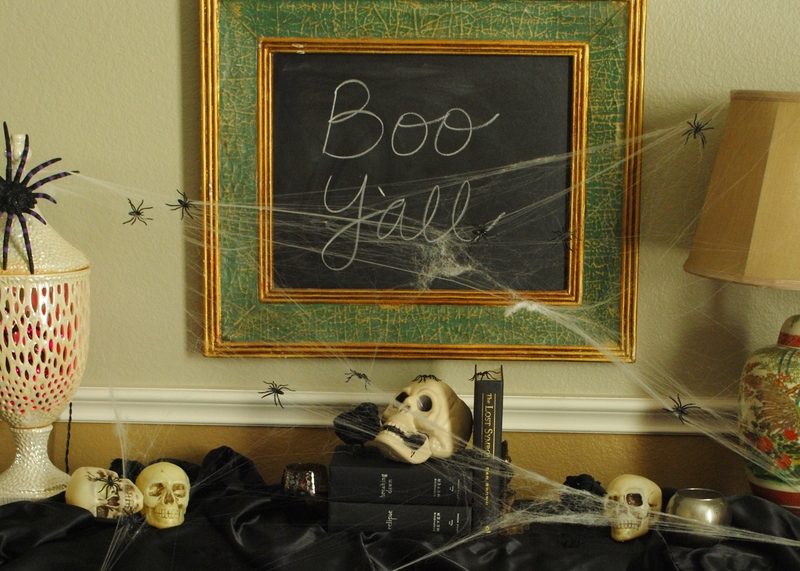 We had our fourth annual Halloween party over the weekend, which means I spent last week cleaning and decorating. At first I wasn’t sure I was up for all of the work this year, but as always, once party time rolled around I was super pumped. And, it was so worth it. Plus, it forced me to really clean my house and backyard. I think I’ve decided everyone should host a big bash at least once a year in order to motivate us to clean up. Generally, when I decorate for holidays, instead of spreading it all around the house, I try to focus on just one or two areas and go “all out”. This year, I did the buffet in the breakfast room and the piano in the dining room (which is where we set up the food buffet). 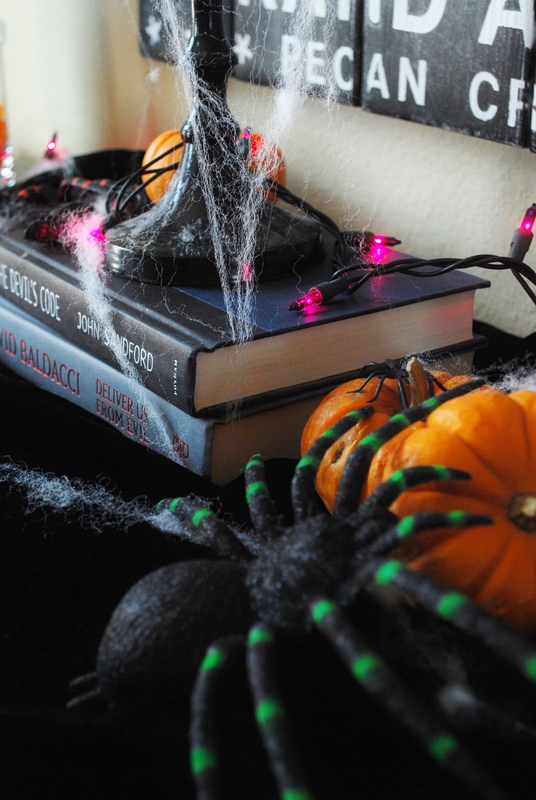 Dollar store spiders, skulls, mini pumpkins and some lights (for a cool nighttime effect) draped in spider webs is all it takes. 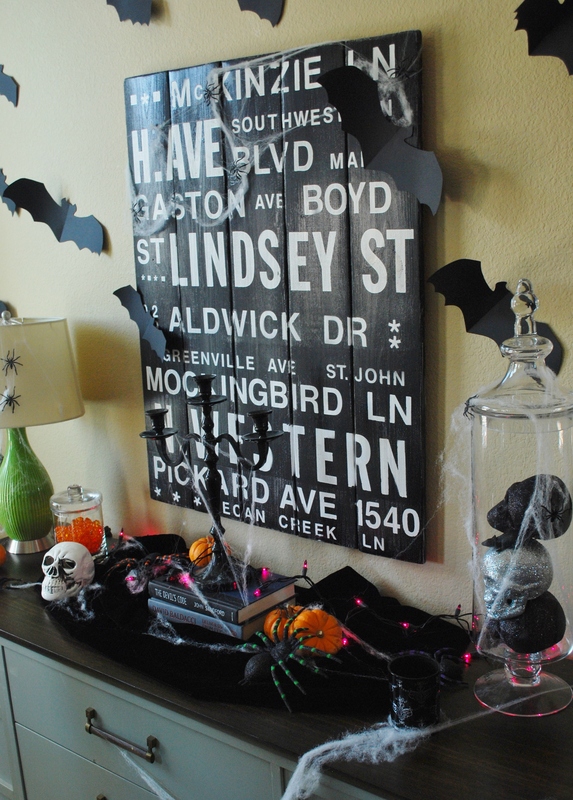 I used some books with Halloween-ish titles to add height. 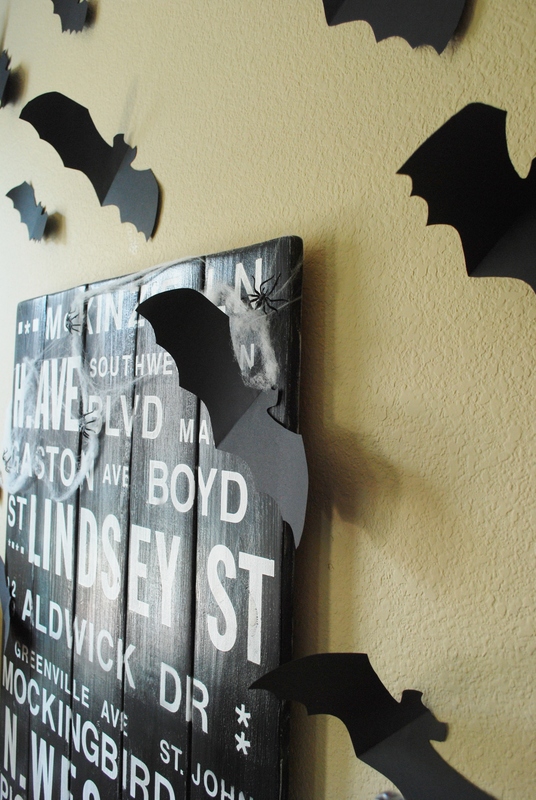 Yep, those are cardstock bats that I cut out one by one myself. I got the idea last year from pinterest, and reused them this year. They are one of the kids’ favorite decorations. I just switch up where I use them. In the dining room, I pretty much did the same thing. 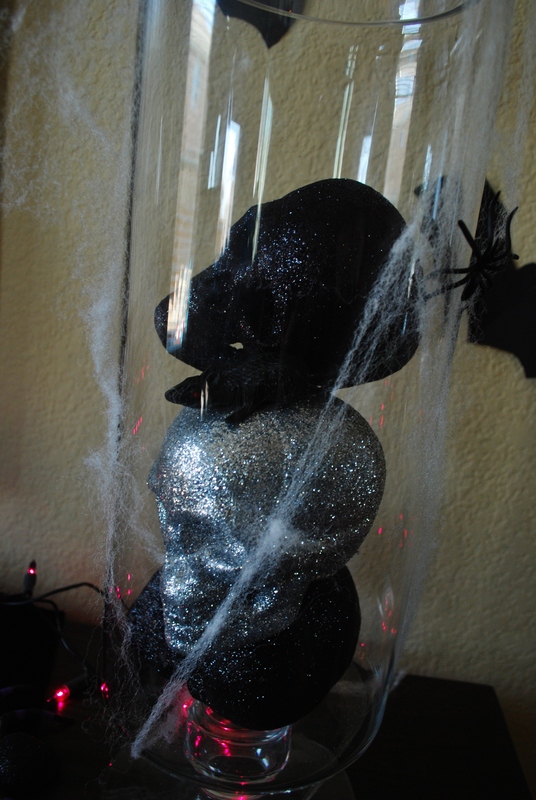 Spiders, webs, birds and skulls. I have to admit, at night it’s much cooler looking. But, I’m bad about snapping pictures during parties. By the time it has started, I’m usually just ready to let loose. 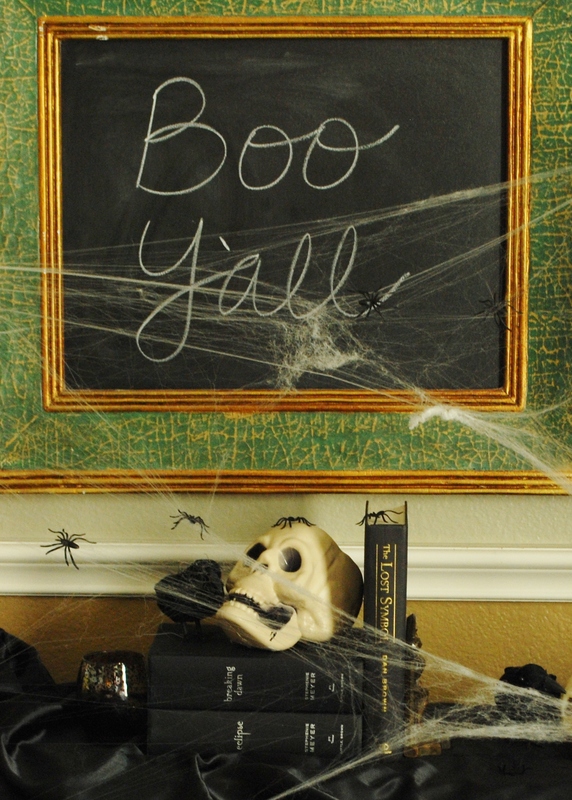 Have you gotten your Halloween stuff out this year? Now that mine is out, I’m already looking forward to taking it down. The kids love it, but I’m ready for more of a fall-theme with acorns, pumpkins, and the like. Stay tuned.